Check here a few locations I recommend for your photoshoot. 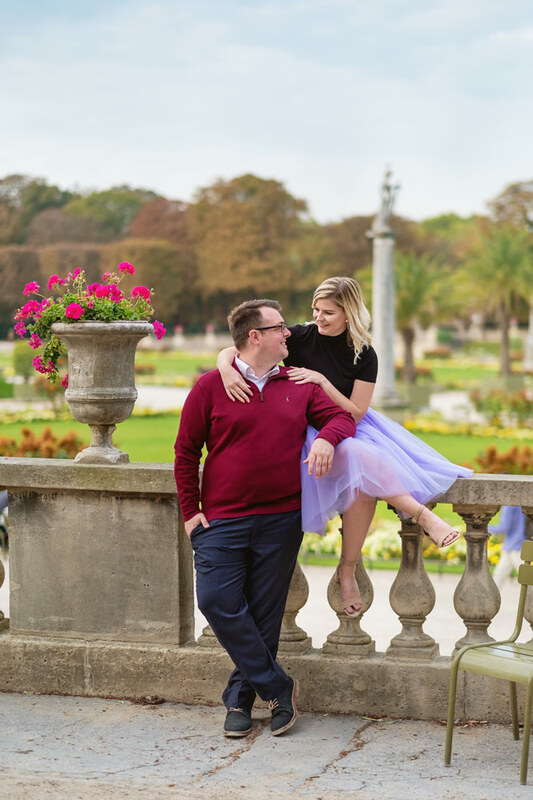 Paris has many beautiful places to celebrate your engagement, wedding anniversary, proposal, pre-wedding, quinceañera, honeymoon. This is the most famous and requested place for photoshoot. The view for the tower is really gorgeous and there’s many places and possibilities for pictures. To create the best images there I highly recommend at early morning to avoid the crowd and catch a beautiful light. 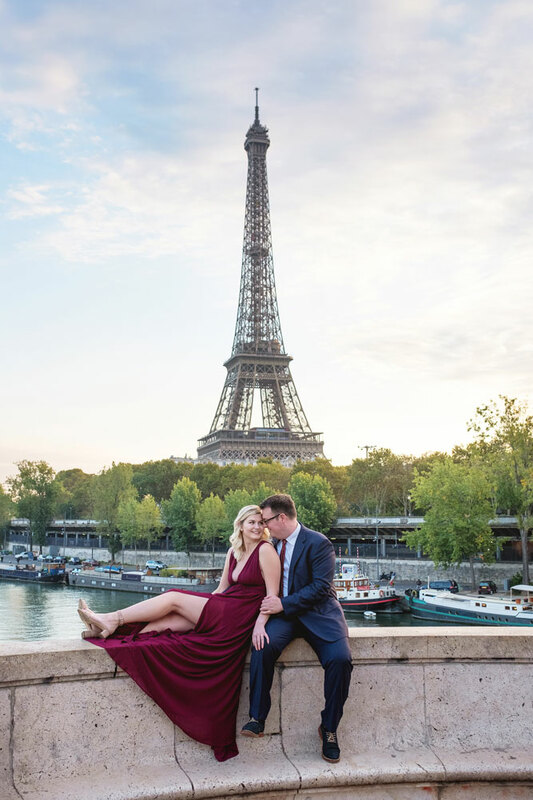 This is an awesome location to shoot with the Eiffel tower as backdrop. This bridge has a square with an incredible view, a covered walkway with beautiful columns and an arch full of details. The main feature is that this place is not very known by the tourists so it’s rarely crowded becoming possible to shoot almost all day. Beautiful in the early morning or at night with the lamps and the tower lit. The greatest museum in the world is also one of the most beautiful places to shoot and very often requested by my clients. It can become very crowded place from mid-morning, so is highly recommended to shoot at early morning, but it’s possible to create awesome images by sunset time and even late at night. This is the most elegant and ornate bridge in Paris, with exuberant Art Nouveau lamps, Nymphs and gilt-bronze sculptures at either ends. On the left bank you can see Les Invalides and on the right bank the dome of Grand Palais. And as if it were still not enough it’s possible to have a great view to the Eiffel tower. This is a very crowded place so recommended early morning session to avoid people in the pictures. This beaux-arts style building was created for the Universal Exhibition in 1900. It’s one of the most important museums of the city. The main spot is the gorgeous golden gate at the top of the stairway. Only possible to shoot there before 10am, when the the museum opens. Just a few steps from Alexandre III bridge can be a complement or just a quick stop when moving between locations. This is a great option for a charming walk by the Seine’s quay with a gorgeous view to Notre-Dame church and bridges. All the surrounding is full of nice pictures possibilities. I personally love this location. This is a beautiful garden and very central, in the same area of the Louvre. Full of paths and fountains is surrounded by Parisians buildings. A great option from Spring to Autumn. The most ornate garden in Paris is kind of a paradise inside the city. It contains over a hundred statues, monuments, fountains and the beautiful Palace today owned by the French Senate. From spring to Autumn is a blast for the eyes. This is a beautiful Palace inside Paris with courtyards, art installation, covered arcades and a graceful garden with fountains. It’s located very close to Louvre Museum and Tuileries garden, it can be a good option if you’re looking for a less common and original place. A street with awesome view, just 10 minutes walking from Trocadero can be a good option to create original pictures with buildings, Parisian lamps and the tower as backdrop. One of the major public squares in Paris has exuberant fountains and a giant egyptian obelisk. This location is very central and close to Tuileries garden and Louvre Museum. Also know as Lock’s bridge this is pedestrian bridge with special view to Île de la Cité, Pont Neuf and the Institut of France. It’s possible to go down by the riverside, a plus that makes this spot very versatile. Very close to Louvre Museum can be an option to split the time shooting in both locations. The most charming neighbourhood in Paris, a small city inside the city, full of beautiful cobblestone streets, stairways, cozy Cafés, and the beautiful Sacre-Coeur church. A crowded area, so I highly recommend to shoot at early morning when you feel the place belongs only to you and your beloved. This charming bridge connect the right bank with Île Saint-Louis. It has view to Notre-Dame towers, and Parisian buildings. The area is awesome, being possible to walk by the riverside or by the streets around. It has many cozy Parisians Cafés nearby to create a few nice pictures. The oldest bridge in Paris has a nice view all around with good spots nearby to shoot like the square du Vert-Galant, Place Dauphine, the riverside and charming streets. This a versatile location with different spots. If you want to do a street shoot with Parisians buildings as background I can suggest a few cool neighbourhoods like Marais with its historical streets and the famous Place des Vosges or Saint-Germain-des-Prés a very charming area with small streets and many Restaurants and Cafés for interesting backdrops. We can plan to do part of our shoot in a nice Parisian Café, this can add a special touch for the session. I recommend this option for two or more hours shoot.